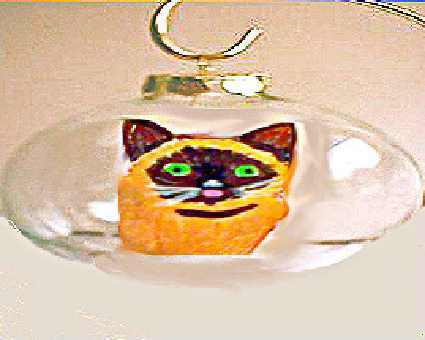 Hand painted Siamese cat Christmas ornaments are perfect for your Christmas tree or to celebrate your cat year round. 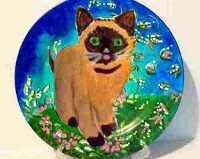 Four-legged family members rank at the top of the holiday list so give a hand painted cat Cristmas ornament. Siamese cats are great communicators and they love to tell you when they are hungry or need that special rub. They are like baby ducks that imprint as they will follow you where ever you go to keep you close at hand. Siamese cats come in four colors: seal, chocolate, blue, and lilac point where the darker color is restricted to the face mask, ears, legs, and tail, while the body remains a lighter color. We try to capture those colors in our hand painted Siamese Christmas cat ornaments.